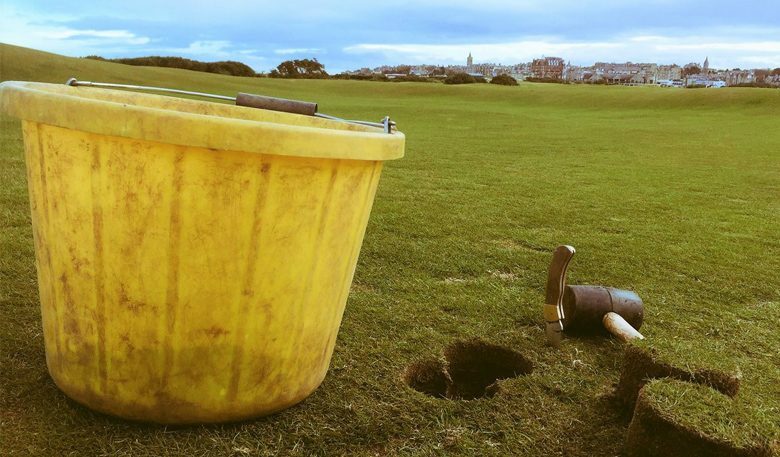 As we move into the winter period, each year the process of plugging out divot scars on the Old Course begins. This has been undertaken by our dedicated seasonal greenkeeping team over the last few weeks. 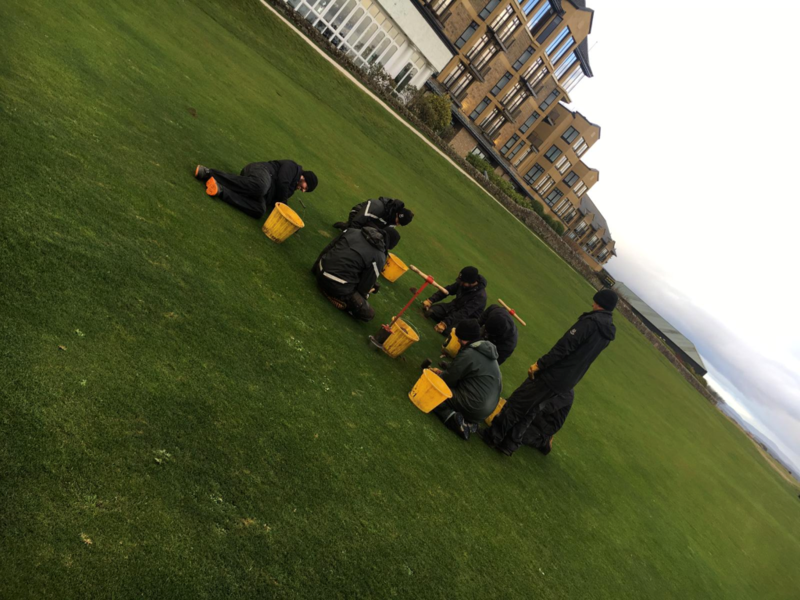 There is a real international flavour to the team with greenkeepers from Spain, Italy and Scotland carrying out this very important task. 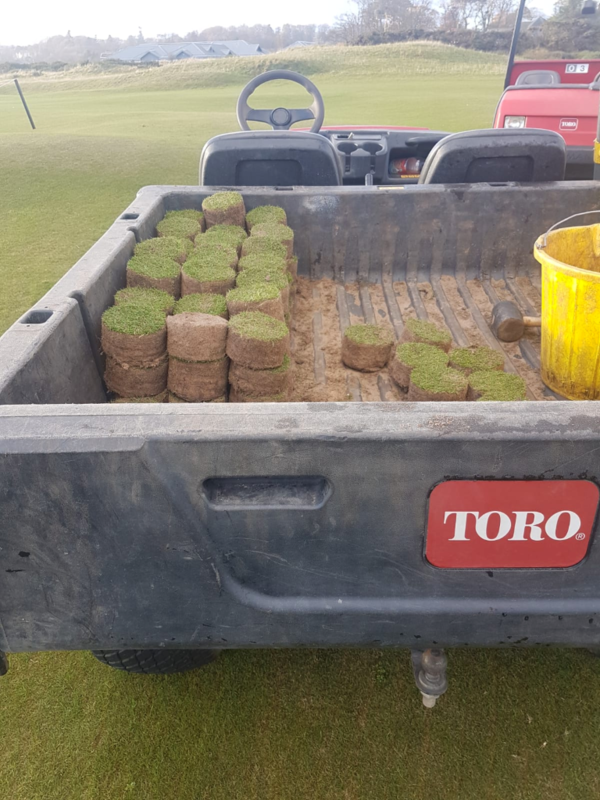 As there is less growth in winter, plugging is a way of fixing the divot scar problem at this time of year as seeding would have less chance of germinating. 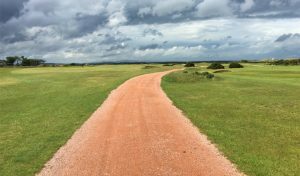 The process begins by checking the turf nursery and selecting areas with the most consistent soil and grass. 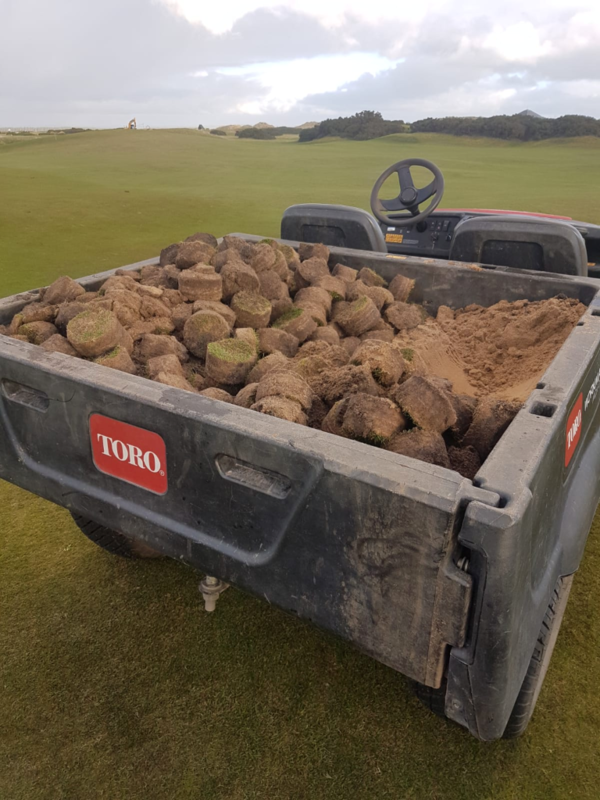 We started by taking out golf-hole sized plugs until two of our Toro Workman trucks were full – roughly 400 per truck! When two of the trucks were completely full, we went to the 12th hole to start this huge job. The 12th made for a good starting point as there’s a heavy concentration of divot scars between the two groups of fairway bunkers and being on the back nine there was a longer window to work before play made its way around. 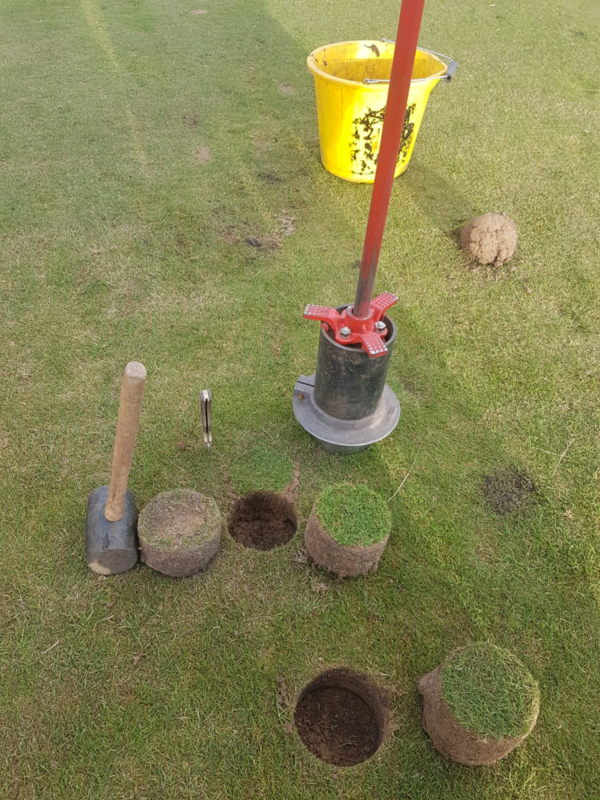 Usually two of us took the red plugger (tool in the above picture that removes old plugs) and the rest of the team filled with the fresh turf. After a couple of days we started to get into a good rhythm with both teams coordinating well and enjoying the work as we went. In the above picture we see the old plugs just before they were disposed of in our recycle area. This space is where old bunker faces, grass collections and similar are deposited. 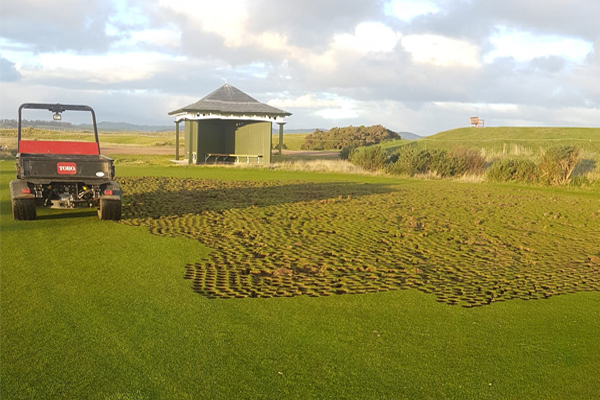 Over time, the broken down material is re-used on the golf courses as divot and pre-turf mix before laying turf during winter restoration. In one morning we completed two and half truck’s worth of plugs which is pretty good going! When we finished a hole and had just a few plugs left, we went back to the turf nursery to refill for the next day. 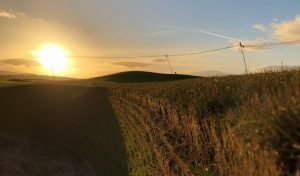 The first couple of weeks we were really lucky with the weather as we enjoyed some beautiful sunrises and sunny days. The final week wasn’t so good but we stuck in. Everyone wanted to finish the job as soon as possible but also to the highest standard. The process of plugging is mentally and physically quite tiring but with a good attitude and working relationship between everyone, it was made much easier. In the above picture we are finishing the last plugs of the year. After almost one month of hard grind, this moment was really satisfying! 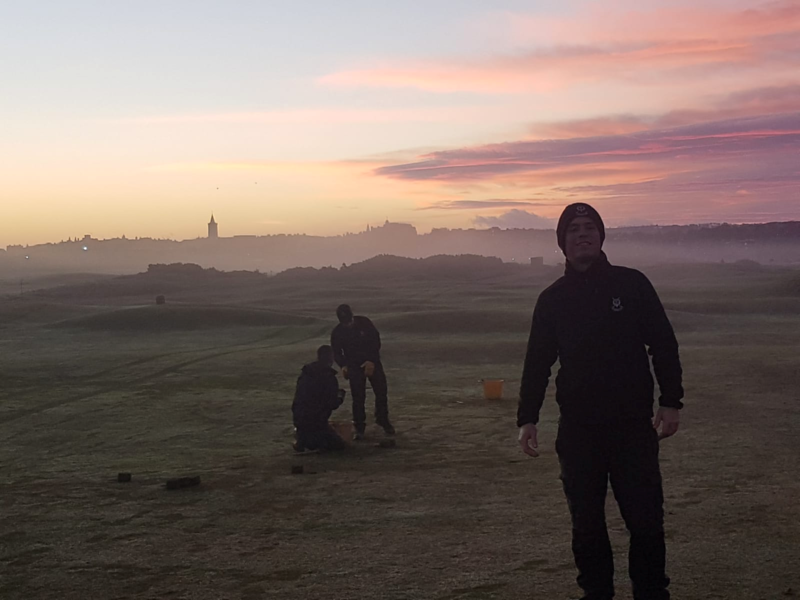 Personally I enjoyed the experience as it’s helped me learn more about the great, historic Old Course and how it’s maintained for the world to enjoy.